Sep 27 05:42: Magnitude recalculated from 5.1 to 5.2. Hypocenter depth recalculated from 71.0 to 66.0 km. 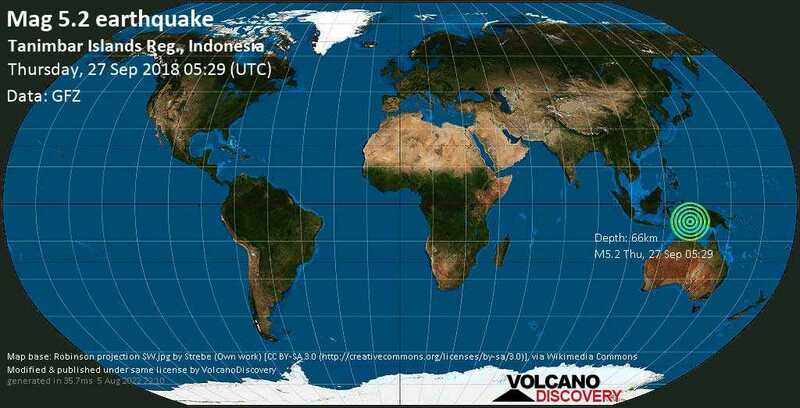 Teluk Intan ,Perak ,Malaysia (3556.3 km WNW from epicenter) [Map] / MMI II (Very weak shaking): As I was on the bed late evening( around 5:30 pm local time )I felt like very light earthquake. I have experience going through stronger earthquakes. So I can say i felt it and my friend near me felt it too. Is it possible?